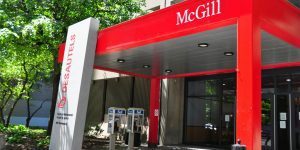 The McGill-HEC Montréal Executive MBA program is a joint 15-month, bilingual program with classes held at both the McGill University Desautelts Faculty of Management and HEC Montréal campuses. Classes are held four times per month from Thursday through Sunday for the first 11 months, with the schedule starting in September. No classes are held in July. Two and half weeks of residential modules are included in the total nine EMBA modules. The first nine modules of the McGill-HEC Montréal Executive MBA take place over the nine months, in addition to a two-and-a-half residency. The school notes that the nine modules fit in to the “broad” educational categories of: business challenges; managerial tools and techniques; and managerial mindsets. The final four months of the program are built for a personal, integrative project of the student’s choosing. Students in the McGill-HEC Montréal Executive MBA are typically 41-years old and join the program with about 17 years of previous work experience, including 12 years of management experience. About 38 percent of the class know at least two languages, and female students make up about 45 percent of the class. All tuition and program fees for the entire McGill-HEC Montréal Executive MBA program are currently $89,000 CDN. An $8,000 CDN nonrefundable deposit is required in order to hold a spot in the program after gaining admission. Two types of scholarship opportunities are available for management students working in nonprofits, and for managers of indigenous origin. Application information on those scholarships can be found here. Financing information, including federal and private loan opportunities, can also be found here. The school encourages those with significant management experience to still apply, even without an undergraduate degree. The program looks for students with at least 10 years of prior work experience and five years of management experience. A 45-minute in-person interviews will be conducted for favored candidates. GMAT/GRE scores are not explicitly reviewed as part of the application process.